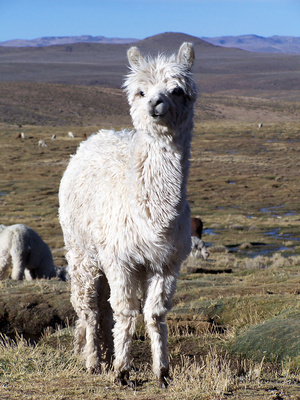 The alpaca, from the high Andes Mountains, is one of the world's most endearing domesticated animals. The Alpaca and Llama are in the Camelidae family. The Alpaca was bred specifically for its soft lanolin free soft wool that makes an ideal hypoallergenic fiber. The alpaca came close to extinction during the conquest of Americas. Fortunately dedicated farmers and preservationists have worked tirelessly to restore the alpaca population. In recent years, there has been a surge of interest in raising Alpaca in the Mountain West. Alpaca Boutique is a site from Alameda, California that offers a collection of sweaters, hats, and gifts made of Alpaca fiber.